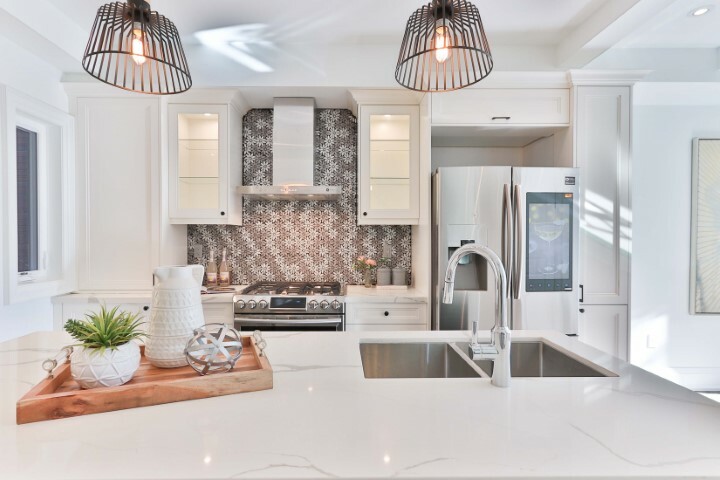 Whether you’re currently renovating your kitchen or your old kitchen faucet is on its last legs, choosing a kitchen faucet that fits your needs is no easy feat. Should you splurge on the highest quality faucet available on the market today? Or should you invest in a more cost effective option? What brands offer the best faucets for the most reasonable price? Fortunately, when choosing a kitchen faucet, there are hundreds of options to choose from. Though despite the wide variety of choices, it can be a challenge to decide on which one will work best for you. In this best kitchen faucet ultimate guide, we’ll be covering ten of the best kitchen faucet options for your home suitable for wide range of budgets, as well exploring what to look for when buying a faucet. By the end of this guide, you’ll be well equipped to purchase the faucet that is right for you, and know with confidence you’ve made the right choice. Before you make your purchase, be sure to check out in-depth kitchen faucet FAQ as well as detailed buyers guide to help with your decision! When should I buy a new faucet? What are the best brands of faucets? Should I install the faucet myself? Can I convert from nonspray to spray faucet models? How can I clean my faucet? Does the quality of faucets really matter? I use my faucet a lot! Which one should I choose? What to look for in your faucet brand? With hundreds of quality reviews on Amazon, the Delta 9159-AR-DST faucet is an incredibly popular option and one of the best luxury faucets on the market today. Built and manufactured by one of the premier kitchen appliance brands, Delta, you know you’re going to get a high-quality faucet with some of the best customer service in the industry. In addition to being super simple to install up and running quickly, the faucet leverages the patented diamond seal technology which reduces leakage helping it last up to 2x longer than other similar faucets. Best yet, your Delta 9159-AR-DST guarantees a leak-free operation for the life of your faucet. Always known to be innovators in the modern kitchen appliance space, this Delta faucet comes with the incredibly convenient MagnaTite magnetic docking system, making it a breeze to quickly store your kitchen sprayer into place and not have to worry about it hanging over into your sink. The Delta 9159 AR-DST comes with everything you need to get started right out of the box and can be installed with no previous experience required. Included with your purchase are the supply lines needed to hook up your faucet and the two function spray wand that gives you the choice of spray or stream use. 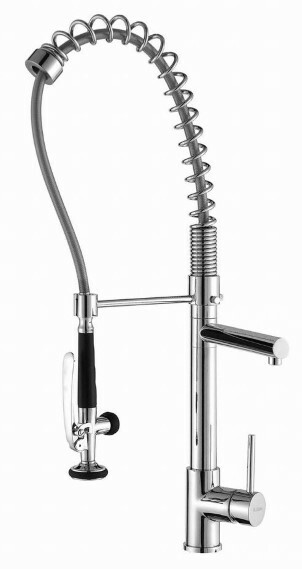 One of the highest quality and versatile kitchen faucets on the market today. It is built and manufactured by one of the leading kitchen appliance brands. Patented diamond seal technology reduces leaks making this faucet last 2x longer than other brands. 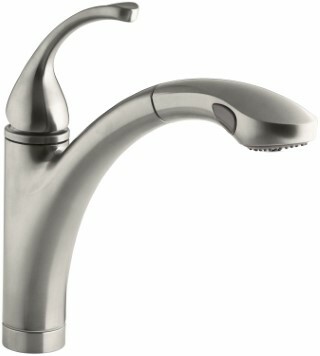 One of the more expensive faucets on the market, but the quality is unmatched. It is designed to be a side-handle faucet which may be a deal breaker for those looking for a specific faucet style. Does not have a soap dispenser. 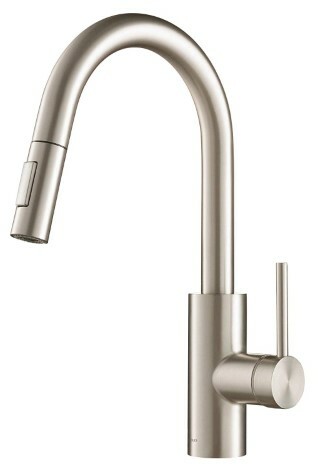 One of Moen’s best selling higher end faucets, the Moen Arbor 7594ERS takes the traditional faucet to the next level. Built with two sensors powered by the latest MotionSesne technology, this faucet delivers an incredible hands free experience giving you the ultimate control when using the faucet. 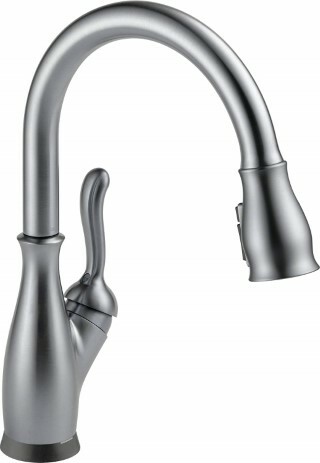 Moen Arbor 7594ERS is super easy to install thanks to it’s duralock quick connect system that snaps the faucet into place. Out of all the faucets we reviewed, this was one had the most comments on how easy it was to install. Even better, the easy install system doesn’t require any additional outside tools so that you can get up and running straight out of the box. 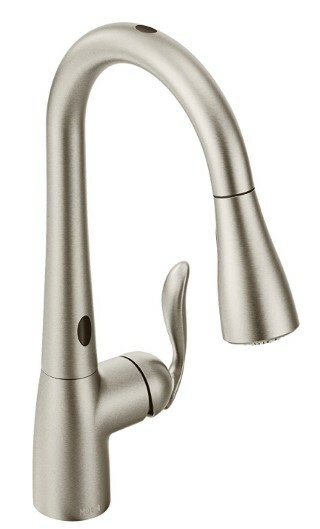 Moen Arbor 7594ERS touchless faucet is crafted with Moon’s signature spot resist stainless finish making your new faucet immune to those ugly fingerprints and water spots that you don’t want anyone seeing. With minor cleanup after use, you can keep the faucet in good shape for years to come with minimal effort on your end. Available in your choice of chrome, matte black, oil-rubbed bronze, or spot resist stainless finish, it’s not hard to find the perfect style for your needs. 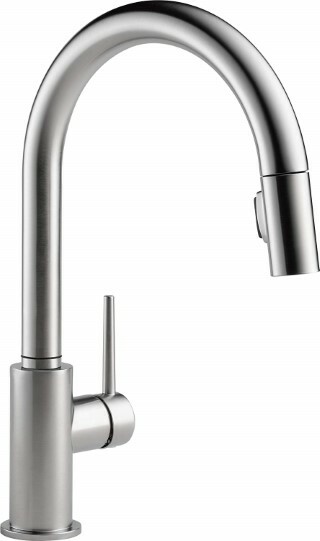 Overall the Moen Arbor 7594ERS is a fantastic, but admittedly pricey faucet option. If you’re looking for the best of the best, give this one a further look. Hard to find a better quality faucet on the market today. Has a five year warranty on digital components. Great flow rate compared to other models. Definitely, a higher price point compared to other faucets. According to some reviews, after years of heavy use, minor leaks can occur. 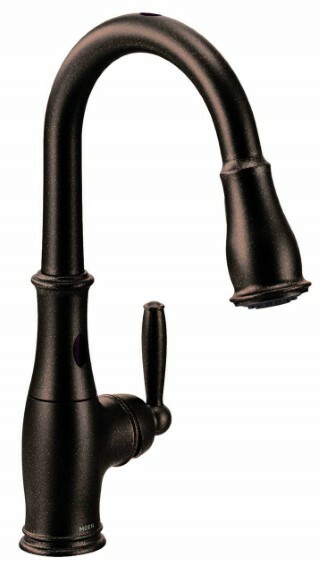 Next on the list is the incredible value pull out Koheler K-10433-VS Forte faucet. Designed with extreme simplicity in mind, this faucet is both visually appealing and functional for all your kitchen sink needs. The pull out faucet design gives you the ability to control water with only one hand and can effortlessly extend outside the sink perimeter so for extra functionality depending on your needs. The K-10433 comes with a two function spray head covering your aerated stream and spray options and can be switched back and forth quickly and easily. The spray function works wonders on while doing dishes while the stream function packs enough punch for those tasks that require a little more water pressure. Out of the box, the K-10433 is easy to install and the hose and spray head come pre-built which means less time setting your new faucet up and more time putting your new kitchen toy to work. With 1 or 3 hole options, this faucet fits a wide variety of sink types and can comfortably slide into your current kitchen setup with minimal fuss. Additionally, the magnetic docking helps keep the spray head securely in place, so it doesn’t slip when not in use. Choose between your choice of 5 stylish colors to fit your exact kitchen design. With a lifetime warranty, this is an excellent option if you’re looking for a sink faucet that looks great and gets the job done. One of the highest quality faucets on the market today, backed with a lifetime warranty. Magnetic docking with secure hose grip. One of the higher priced faucet options which makes it not suitable for all budgets. If you’re looking for a high quality and extremely durable faucet produced by one of the most reputable faucet brands, Kraus, the KPF-2620 SS modern single level pull down faucet might be precisely what the kitchen doctor ordered. Incredibly stylish with it’s stainless steel finish, and designed with a single lever design to keep your sink workflow simple, this faucet will blow you away with its simplicity and wide-ranging functionality. Thanks to a high arc spout, this faucet gives you complete sink access so you can reach those otherwise impossible sink positions. The Kraus KPF-2620 SS single level pull down kitchen faucet has a dual function pull down sprayer with a secure dock which uses a counterweight to hold the hose length in position when you’re through using the faucet. Like all Kraus faucets, the Kraus KPF-2620 SS is corrosion and rust resistant, so you don’t have to worry about extreme wear and tear after minimal use. This faucet is built with long term performance in mind. Best of all, the neoperl aerator nozzle is extremely easy to clean and built to prevent that always inconvenient hard water build up. With a warranty backed by the reputable Kraus brand, the moment you make your purchase you know you’re in good hands. Available in brushed chrome, polished chrome, vibrant brushed bronze, vibrant brushed nickel, and vibrant stainless, this all around faucet can undoubtedly find a spot in your kitchen. A great value at a mid-tier priced point, this faucet is known for its incredible durability. Built by Kraus, one of the most respected faucet brands around. Due to its design, the faucet can be difficult to repair by yourself. Does not include all water line hoses depending on your sink. The Delta 9192T is arguably the best pull down kitchen faucet on the market today and is built to deliver an exceptional experience. This beautifully designed faucet includes the incredibly convenient touch on touch off functionality making it a cinch to use even if you have messy hands. The Delta 9192T also comes with the TempSense LED indicator light making it easy to know whether the water is hot, warm, or cold, so there are no surprises when in use. Thanks to its patented diamond seal technology, the faucet lasts up to 2x longer than other leading faucet brands and ensures a leak free experience no matter how often you need to use your sink. Where the Delta 9192T really stands out is its powerful spray that uses ShieldSpray technology to help you get the job quickly, and reduce the time you spend washing dishes at the sink. The Delta 9192T-SSSD produces up to 90% less splatter than regular faucets, which means no more random side spray! Designed to fit 2,3,4 or even 8 inch setups, this faucet can be installed effortlessly in virtually any type of sink and comes in both chrome and stainless finish. The best pull-down kitchen faucet money can buy. Incredibly easy installation and the magnetic docking feature is a very nice touch. Diamond seal technology means the Delta 9192T lasts up to 2x longer than other faucet options. Though a high quality faucet, the premium cost may not fit all faucet budgets. Another fantastic faucet option from Delta, the 9178-AR-DST offers what you would expect from one of the leading faucet brands at a reasonable price for a premium offering. It’s available for purchase in Arctic Stainless, Venetian Bronze, an Chrome finishes, making it fit most kitchen styles and colors. Incredibly easy to install and set up quickly, the Delta 9178 AR uses the simple to use Duramount mounting system which also helps to reduce potential leaks through extended use. The faucet head can be cleaned in seconds thanks to its touch clean technology, so the faucet functions like new during each use. Like it’s more premium sibling product, the Delta 9192T-SSSD-DST, the Delta 9178 includes the popular touch on touch off functionality making it easy to use while your hands are dirty. Additionally, the Delta 9178-AR-DST also comes with the popular Tempsense LED light which showcases current water temperature, so there are no surprises when using. At about ¼ the cost of the premium Delta 9192T-SSSD-DST (Best Pull-Down Kitchen Faucet), the Delta 9178-AR is a fantastic mid-tier to premium faucet that can quickly upgrade almost any kitchen. With a limited 5 year warranty, you would be wise to consider picking up a Delta 9178-AR-DST Leland for your home. One of the most popular mid-tier to premium faucet options on the market today. Backed by the highly reputable Delta brand. Reasonable price point while remaining high quality. Designed to be a side handle faucet which might not fit all kitchen sink types. Could use a higher quality retainer piece for the hose. If you’re looking for a great all around faucet for your kitchen, the Moen 7185EORB Brantford will certainly do the trick. Offering a completely hands free experience thanks to MotionSense technology, you can use your sink easily even if your hands are full or dirty. Put your hands or dishes underneath the faucet and the water will automatically dispense. In addition to offering a seamless hands free experience, the Moen Brantford includes a powerful hose with a large amount of flexibility making it perfect to use for all those hard to reach places in your sink. The faucet includes a pull down wand with two distinct spray modes so you can clean vegetables, or do those dishes with ease. The Moen 7185E is designed to fit a 1 hole mount with an additional 3 hole set up included with your purchase. Overall this faucet not only has a high level of functionality and performance, but it will also look incredible in your kitchen. With your choice of oil-rubbed bronze, spot resist stainless, or chrome finish, you can’t go wrong with the Moen 7185E. Includes an unbeatable limited lifetime warranty. The Duralock Quick Connect system makes installation a breeze. High quality pull down hose. Some reports of not playing nice with “harder” water types. Instruction manual could be more in depth. Not quite the premium quality of the Delta 9159-AR-DST (Best Luxury Faucet), the Delta 9178 AR-DST gets pretty close in functionality and design. This Leland Single Handle pull down kitchen faucet includes the MagnaTite docking system, and is available for purchase in Arctic Stainless, Venetian Bronze, and SpotShield Stainless finishes. Like other Delta faucet options, the 9178-AR-DST includes the patented diamond seal technology to help reduce those pesky leaks, as well as its signature MagnaTite docking for easy storage of the sprayer once done. It’s incredibly easy to install and is built to work with single hole or 3 hole kitchen sink designs. Its ShieldSpray technology helps you cut through the dirty dishes with ease so that you spend less time in the kitchen and more time doing what matters. 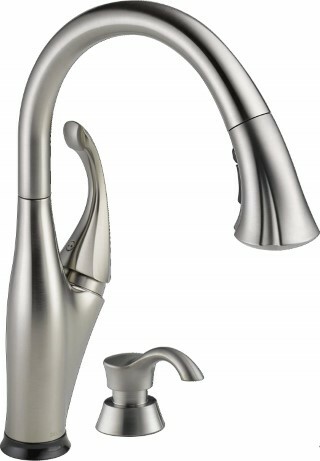 The Delta 9178-AR-DST is a fantastic all around faucet and offers premium functionality at a mid-tier faucet price. All supply lines and other accessories needed to get up and running are included. The hot and cold button has been reported to fall off on occasion. Our pick for the best pull out kitchen faucet, the Delta faucet 4197 offers both style and functionality and is a near certain upgrade to any kitchen sink. Like most Delta faucet models, the Delta 4197-AR-DST comes with Delta’s signature patented diamond seal technology that helps reduce leak points with extended use so you spend less time worrying about repairs and more time doing what needs to be done in your sink! The faucet is incredibly easy to install and get set up, and is built to be used with single hole sink designs, but can fit 3-hole configurations with a minor additional purchase. The Delta Cassidy is built with Touch-Clean spray holes making cleaning the nozzle as easy as touching the small holes after each use. With over five beautiful finishes to choose from and a reasonable price for the value, the Delta Cassidy is a great option for those looking for a high quality single handle kitchen sink faucet. Great price and even better value. Beautifully designed and one of the best pull out kitchen faucets available today. Comes with Delta’s lifetime limited warranty. The sprayer hose could be improved in quality, but a flexible hose overall. Bronze finish has been reported to show fingerprints on occasion. Our pick for the best commercial kitchen faucet, this faucet truly does it all. Designed with more functionality than your average kitchen faucet, the Kraus KPF-1602 really can handle whatever you throw its way. With a commercial kitchen setting in mind, it comes with a handful of additional features that your regular faucet does not. Built with Lead-free brass construction and a rust resistant finish, the entire model is both striking in appearance and safe to use under the latest lead guidelines. Easy to use under heavy duress, the lite touch single level flow control makes it easy to ramp up or turn down the water flow with little effort. Additionally, the Kraus KPF has an incredibly convenient powerful pre-rinse spray function and has a commercial style spring design. For a commercial kitchen faucet, it’s also quite easy to install and get up and running. Everything you would expect from a high quality commercial kitchen faucet and more. Reasonable price for commercial kitchen faucet functionality. Some reports of low water flow, especially when not cleaned regularly. Commercial style faucets don’t fit all kitchen types and styles. There are many things to consider when purchasing or replacing your kitchen faucet. Below we’ve covered some of the most common questions to help you get answers to your questions quickly and easily. Unlike some other household appliances, most kitchen faucets are built to last an extremely long time and should not need to be replaced on a regular basis. That said, in general, you should consider buying a new faucet if your current one continues to have issues, such as leaks, or you’re looking to upgrade to the latest model. Additionally, you may consider buying a new faucet after redesigning your home or kitchen so that your faucet matches your personal home style. We take an in-depth look at some of the best faucet brands today in our Buyers Guide below, however, here is a quick list of some of the most respected brands today. Though the thought of installing your kitchen faucet yourself may be daunting, fortunately, with the latest models, it’s often super straightforward and easy for most people to get their new faucet up and running. The majority of newly purchased faucets come with detailed step by step instructions on how to install your faucet so that you usually don’t have to hire someone to fix your faucet for you. Assuming the rest of your kitchen sink piping is functioning correctly without issue, you can almost always install your kitchen faucet yourself. Before you attempt to follow the instructions for installation, it’s very very important that you turn off the water to your sink before doing anything else. Not shutting off the water can lead to you and your home getting extremely wet and damaged. Generally, for successful installation, you’ll need a basin wrench, a set of adjustable wrenches, supply lines, and some caulk to patch things up. While you can certainly install your faucet yourself, don’t hesitate to reach out to a local professional if you’re feeling uncertain, it’s always better safe than sorry. Because of how each type of faucet is designed, typically you cannot convert a nonspray faucet to a spray faucet model. Depending on how important it is to make the switch, you would likely need to purchase your desired faucet and install brand new. Taking care of your kitchen faucet is essential for ensuring you get the most out of your investment. Taking a moment to wipe down your faucet after each use is a great way to keep your faucet in good shape. When cleaning your faucet, it’s vital that you know the type of finish used on your faucet, as some cleaning materials may not be as effective on certain finishes. The best way to clean your faucet is simply by using dish soap and warm water to wipe down the exterior of the faucet then dry with a hand towel. If your faucet has a stain or two, a toothbrush and baking soda is a great way to remove those. Using a small amount of white vinegar can also help remove build up of grime depending on the finish on your faucet. If you find your faucet leaking, the first thing you should do is turn off the water supply to your faucet before trying to fix or alter anything. One of the biggest causes of kitchen floods is not turning off the water before attempting to adjust your kitchen faucet. Once the water is off be sure to block the drain with your kitchen sink plug or put a towel over the drain. As you mess around with the pieces of the faucet, they can accidentally slip into the drain which is why it’s so important to cover the drain before you try to fix things. Depending on the type of faucet you own, you will likely need a few tools to help you get it fixed, with most being easily found in your standard toolbox at home. Follow the instructions of how to repair your faucet provided by the company you purchased from, or head online to pull up a step by step video of your faucet model. If your faucet is leaking, consider purchasing a faucet repair kit, or giving your faucet manufacturer a call, they will often be able to help you determine the best next steps of action. If you feel uncomfortable fixing you faucet yourself, there are plenty of local repair options you can call. As the old saying goes, “You get what you pay for.” This is especially true when investing in a kitchen faucet. Your faucet is one of the most used appliances in your home; therefore it makes sense to invest in a quality faucet that is both reliable and easy to use. While it’s not necessary to purchase the most expensive brand on the market, most faucets have an expected life of over 15 years, so choosing one that fits your kitchen’s style and is equipped with what you need is a wise long term decision. Fortunately, there are some incredible quality kitchen faucets on the markets today that fit a wide range of budgets. When possible, we recommend investing in the higher quality option, but don’t delay purchasing a new faucet just because you can’t afford the best right off the bat. Your faucet is an important household investment and our buyers guide below will help you make the right decision during your purchase. There are two things you want to look for when purchasing a new kitchen faucet, the functionality of the faucet, and the design. When making your purchase, you want to make sure that the faucet is equipped with what you need to do effectively the dishes, rinse vegetables, and any other task you for which you might use your sink. Functionality above all is the most important component of buying a kitchen faucet. Secondly, you want to ensure that your faucet matches the design and style of your kitchen and home. If your kitchen is all black in color, it might not make sense to buy a faucet that is green for example. As long as you’re happy with the two items listed above, you can purchase your kitchen faucet with confidence. Now that we’ve covered some of the best quality kitchen faucets on the market today as well as some frequently asked questions when purchasing a faucet let’s dive into our ultimate faucet buyers guide. When choosing the right faucet, the brand you decide to invest in matters, fortunately, there are a handful of incredible brands that produce fantastic products and offer a high quality of service as well. Here are just a few of the top appliance brands that are known to create excellent faucets for your home. Headquartered in NYC USA, Kraus is an organization committed to redefining how we interact with our environment, specifically our kitchen. Founded in 2007, Kraus is known to create some of the highest quality kitchen appliances, and their kitchen faucets are always pushing the boundaries of what a quality kitchen faucet should be. Their faucet designs are incredibly functional and are beautifully designed as well. One of the older companies on the list, Delta Faucet Company, founded in 1954 continues to set the standard for high quality kitchen faucets and great customer care. Their incredible faucet designs as well as unique takes on faucet functionality have landed them on popular home makeover shows and as well as countless kitchen appliance rewards. Having been in business for over a 100 years, Kohler knows a thing or two about building beautiful and high quality products for your home and kitchen. On the cutting edge when it comes to kitchen appliances, Kohler was one of the first brands to embrace smart home technology such as Alexa to compliment their kitchen faucet products. When you choose Kohler you know you’re getting the best of the best as well as world class customer service. Moen is another reputable brand known to produce quality products for your home. 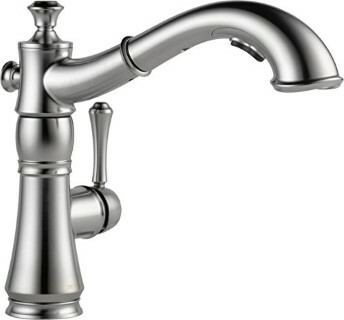 Known for their unique style and amazing customer service, Moen continually produces some of the top rated kitchen faucets each year. Best yet, despite the high quality of their faucets, Moen works to produce options for a wide range of budgets so you can be happy with the faucet you display in your home. An iconic home appliance brand, Grohe really stands out with their kitchen faucets and other kitchen appliances. With their signature lifetime warranty, you can purchase any of their products with confidence knowing you’re in good hands for life. Offering full blown kitchen faucet systems to water filtering products, if you’re looking to upgrade your kitchen, Grohe is a great place to start. Though their parent company has been in business since 1910, Pfister has recently rebranded as an organization and continues to impress the appliance world with their high quality and thoughtful kitchen faucet designs and functionality. With their products being “sleek, stylish, and sopfistercated,” Pfister is a likable brand you can trust. Since its founding, American Standard has aimed to raise the standard of what it means to be a high quality kitchen appliance or faucet. Continually pushing the boundaries of quality and great customer service, American Standard offers a wide range of kitchen faucet options suitable for virtually any budget. So what makes a brand a great option for purchasing your kitchen sink faucet? Use these three points of reference when deciding which brand you should purchase from. Is the brand known for high quality customer service? Are they easy to get answers from? Can they be reached via your choice of social media channel? Do they offer a lifetime guarantee? The brands on the list above, made it to the top because they consistently provided excellent customer service to those who purchased with them. When looking to buy a faucet, spend an hour or two researching your top two or three favorite brands. Does it seem like they take care of their customers? Go with your gut, if a brand doesn’t seem like they treat their customers right, explore a few other options. You want your brand to be known for being a leader in the kitchen faucet space. Have they won any awards? Are their faucets and designs featured in kitchen magazines or home makeover shows? The better reputation the brand has both online and from word of mouth, the more confident you can feel about your decision. While kitchen faucets aren’t the most expensive investment in the world, it definitely is an investment in the future of your home, so you want a brand that has a great reputation. Does your favorite couple brands have extensive experience designing high quality kitchen appliances and faucets? If they have been around for decades, chances are good they have done some of the things they needed to do to stay in business which is a good thing for you. That said, there are some really great up and coming brands who are creating some truly innovative kitchen faucets you should consider trying, so don’t be afraid to give new companies a try. Now that we’ve covered some of the top brands for kitchen faucets, and what to look for before deciding to do business with a brand, let’s take a look at the types of kitchen faucets you can choose from. While there are some minor variations to the types of facets shared below, these are the main faucet options for you to consider. Like its name implies, a pull out faucet is a faucet in which you pull out on the top part of the faucet shaft when you want water to come out of the faucet. Typically square or rectangle in design, the pull out faucet is common in modernly designed bathrooms as well as recently renovated kitchens as well. Simple and to the point, pull out faucets typically don’t offer as much flexibility of functionality compared to other faucet types. A pull down faucet is similar to the pull out faucet with the one difference being you pull down on the lever to get the water flowing. The pull down faucet is one of the most common faucet models today. Separate spray faucets is a faucet that has two distinct parts: the actual faucet and the spray hose used to clean dishes and wash vegetables. Separate spray faucets are incredibly popular faucets in older style homes and gives your kitchen a minimalistic but functional feel. Do your general sink activities with the standard faucet, and leverage the pull out hose when you need some more flexibility. A dual handle faucet is a faucet that has two handles, with each handle often specifically devoted to controlling warm and cold water. While the functionality of these dual handle faucets is undoubtedly convenient, the installation of dual handle faucets does require a little more work to install than other options. The most basic type of faucet, a single handle faucet is a faucet with one handle and no extra bells and whistles. Perfect for a home looking for a minimalist feel, a single handle faucet is moved directionally to set the specific water temperature you need while doing dishes or washing vegetables. A commercial style faucet is one that definitely stands out from the crowd, and is often purchased with the intention of really making the kitchen pop in a stylish home. Usually, including a long and carefully designed faucet hose, a commercial style faucet often has a handful of unique twists, shapes, and turns and multiple faucet hose holes. Relatively new to the kitchen faucet scene is the motion detection faucet, something you may have seen in the bathroom of a fancy restaurant. Activated using motion, these faucets are incredibly high quality and give your kitchen sink a sophisticated and stylish feel. Now that we have looked at the types of kitchen faucets on the market today, what about the material in which they are made from? The vast majority of faucets today are made from brass then covered with a wide variety of finishes to make the faucet shine and match various kitchen styles. Of course, not all faucets are made from brass, but a general rule of thumb is to assume the base material is brass for most faucets. Because brass consists of various elements such as zinc, copper, and lead, small amounts of lead can leak into your water supply. Given that the consumption of lead in even small quantities can lead to adverse health effects, recent laws and regulations have pushed to ensure that faucet manufacturers keep the percentage of lead in their brass faucets below 8% lead. Though there are dozens of materials used for kitchen faucets, the most common are as follows. This type of material gives off a vibrant and vintage look making any kitchen sink truly stand out. Polished brass is incredibly easy to clean and maintain, and can be matched well with most kitchen accessories and colors. Considered a slight upgrade from polished brass in terms of appearance, Satin brass gives off a strong gold look, without coming off as over the top. If you’re looking for a faucet that really takes your kitchen to the next level, satin brass is a great material to choose. An unmistakable material, copper really makes your faucet pop and can compliment the rest of your kitchen design nicely depending on your specific kitchen style and color choices. One of the advantages of using copper as the material for your faucet is copper is known to have natural antibacterial properties which works to keep the material in tip top shape over time. If you’re looking for a clean and truly “polished” feel, polished nickel is a great choice thanks to its durability and unique dark appearance. A great alternative to a polished nickel material, brushed nickel is one of the most durable materials used in faucet’s today. Not only is it incredibly durable, but it’s appearance is distinct and sure to make a lasting impression in your kitchen. Brushed nickel is a bit pricier than other materials, but makes up in the overall quality of your faucet. An increasingly popular material used for faucets, chrome is both inexpensive and durable, making it a great choice for your faucet. Its appearance can be matched well with most other color, and kitchen design schemes and the final product is something you can be proud of displaying in your kitchen. Compared to other materials it can highlight those persistent fingerprint marks, so regular cleaning is recommended. Now that we’ve covered various faucet brands, the types of faucets, and the materials you can choose, let’s take a look at some other important factors when choosing your faucet for your kitchen. When choosing a kitchen faucet, you want to choose an option that is easy to install. Fortunately, many faucets today can be installed in minutes using common tools in your home toolbox. That said, even for faucets that require a little more setup, a quick call to a local mechanic should help you get your faucet up and running in no time. Because faucets generally last for 10-15 years, don’t be afraid to choose a faucet that might be a little more difficult to set up. Once installed, you likely won’t have to uninstall it for quite some time, so it’s important not to let the ease of installation sway your choice all that much. Many faucets include step by step instructions on how to set up the faucet but thanks to hundreds of amazing video tutorials online; you can usually troubleshoot the installation process if you ever get stuck. Again, it’s relatively cheap to hire a professional to come help assist you with the installation if you prefer having guidance throughout the process. An often overlooked aspect of purchasing a faucet, you want to buy a product that has an extremely lenient warranty policy. At the very least, look for a warranty that covers defects and lasts within the range of five to ten years. The absolute best warranties come with a lifetime guarantee which gives you even more peace of mind when making your purchase. Because faucets are meant to last a long time, you want to ensure you’re protected in case of a minor issue crops up. The last thing you want to have to deal with is purchasing a brand new faucet in the rare chance your issue isn’t covered by the warranty. Before you purchase make sure you are fully aware of the exact warranty details before pulling out your credit card. Though the vast majority of faucets are affordable for most kitchen budgets, the price is an important factor when deciding which option you choose. Given faucets don’t need to be replaced all that often, we suggest always leaning towards the higher quality option if your budget allows for it. Over the life of your faucet, a high quality faucet can be had for as little as a few dollars a year. While a higher price point doesn’t automatically ensure better quality, once you’ve decided on the material and type of faucet you would like to purchase you can continue your research and find the price point that makes the most sense for your specific situation. The size of the faucet you choose is also an important factor for making sure you are pleased with your purchase. Most faucets can fit a wide range of kitchen sizes, but avoid purchasing a large faucet if your kitchen is on the smaller size. Lastly, before making your purchase, spend some time reading as many seemingly nonbiased reviews as possible. While brands are incredibly good at marketing, the truth is, the more reviews you read (both the good and the bad) the better prepared you’ll be to purchase the faucet that fits your needs. Avoid putting too much stock in overly negative or positive reviews and instead seek reviews that give an honest and thorough review. We hope this ultimate guide to kitchen faucets has helped you make the best decision for your needs. Additionally, we believe our in depth reviews of some of the best faucets on the market will help you make the right choice. Given that kitchen faucets are one of the most used appliances in your home, taking the time to do your research and choose the right faucet is a must! Good luck!